In August of 1996, MAHS divers worked with the Bermuda Maritime Museum and archaeologist Billy Ray Morris to document the wreck of the Constellation, one of the premier dive sites in Bermuda. 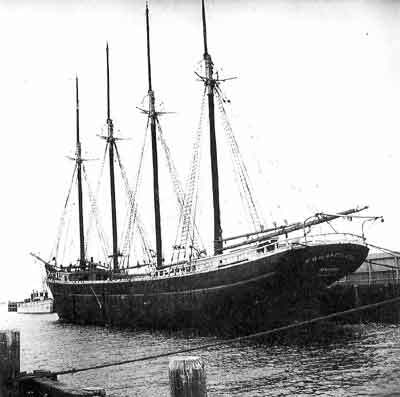 The Constellation was a four-masted schooner built in 1918 by Frye Flinn of Harrington, Maine. Pressed into service as a cargo vessel in World War II, Constellation was on her first run, sailing from New York bound for La Guira, Venezuela, in the late spring of 1943. She was laden with building materials, including plate glass, slate, ceramic tiles, and thousands of bags of cement. She also carried bottles of of everything from nail polish to mineral water, barrels of cold cream, 700 cases of Scotch whiskey, and 400,000 drug ampoules containing adrenaline, anti-tetanus serum, opium, morphine, and penicillin. Shortly out of New York, the ship began experiencing problems with her pump. Bad weather eventually forced her captain, 71-year old Howard Newes, to head for Bermuda for repairs. 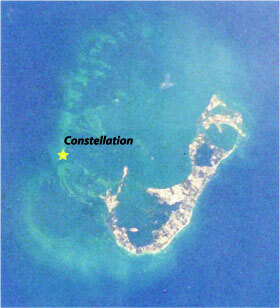 Constellation arrived at Bermuda safely, but while awaiting a pilot to steer her through the treacherous reef system surrounding the island, she was swept by currents onto the reef at Western Blue Cut, about 8 miles northwest of the Royal Navy Dockyard at the west end of the island. The schooner was a total loss, yet some of her cargo was salvaged -- including the 700 cases of whisky, reportely salvaged by the U.S. Navy. Some of the historical information for this page was adapted from Daniel and Denise Berg's Bermuda Shipwrecks published in 1991 by Aqua Explorers, Inc., East Rockway, NY.